Are You an EHS Victim? Per Segerbäck is a former Ericsson RFIC designer who spent a couple decades immersed at work in RF radiation. The result for Per is electro-hypersensitivity (EHS), a condition whereby victims are physically affected by the presence of EM fields at specific or all frequencies. He gets headaches, rashes, or nausea in the presence of fields, causing him to retreat to an isolated shack in the woods. Batteries power his home and no radios or cellphones are allowed. Sweden is the only country to accord EHS sufferers the same government benefits as blind and deaf citizens - including generous payments for remedial services. It even paid to put a metal shield around his house. Spoiler Alert! If you have not seen Night at the Museum: Battle of the Smithsonian but plan to, read no farther. 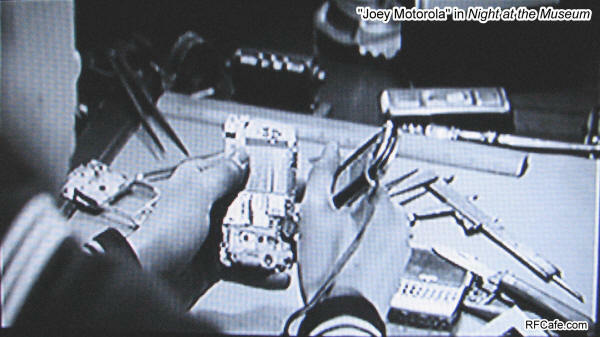 Unless you watched into the credits roll at the end, you might have missed the young sailor's mother calling to her son, Joey Motorola, sitting at his WWII era workbench reverse engineering the phone that Larry dropped while inside the photo. Of course the Galvin brothers of Chicago - Joseph (Joey?) and Paul - founded the company that became Motorola (combination of Motor and Victrola for auto radios). ...a clever play on history. Did you know that we have a National Electronics Museum in the U.S.? Neither did I until I saw an article in the December 2009 edition. Located near the Baltimore-Washington Int'l Airport, the museum was founded by the Westinghouse family. The company had (now NG) a major radar design & manufacturing facility adjacent to the airport, and contributed profoundly to all realms of early electronics. Included are artifacts from many contributing companies. Part of the display appeared at the IMS-2009 show. Yet again, a study has been printed concerning the average transfer speeds of broadband in various countries. Yet again, the U.S. is at the bottom of the heap. The primary reason is widespread DSL and its use of legacy copper twisted pair transmission, which is sloooooow. Flash: Since the U.S. is financially utterly broke, what say we stop spending $$$ on other countries (their wars, their development, etc.) and bring our own back up to higher standards for a change? The editors of Technology Review (MIT) looked at companies that over the last year have demonstrated their superiority at inventing technology and using it both to grow as businesses and to transform how we live. They then examined business models, strategies for deploying and scaling up technologies, and the likelihood of success. The result is the first annual TR50. Of course familiar names like A123 Systems (batteries), GE, Nissan, Google and Apple are included, but there are also many less-known companies who are pioneering ground-breaking technologies. The concept of literally shooting microsatellites into space has been around a long time. Logistics (location for the huge size) and physics (high G forces, targeting) have thwarted realization. "Quicklauncher," a 3,600' long cannon floating in the ocean near the equator (for the rotational slingshot boost), might be the solution. Its portable floating platform - dipping 1,600 feet below sea level and steadied by a ballast system — would let operators swivel it for different orbits. Heat-expanded hydrogen gas propels the payload to 13,000 mph with a 5,000-G kick. The cost: $250/lb vs. the conventional $5,000/lb. Math defines the universe. That car you are attempting to parallel park is part of the universe, so it should come as no surprise that there is now an equation that defines the minimum dimension necessary to accomplish the task. Program this into your TI-83 Plus and keep a tape rule handy to be prepared for the next time you are eyeing a parking spot and wondering whether your ride can be squeezed in. Maybe this is what the Lexus LS 460L uses as part of its auto-parking algorithm. The federal government is "doing everything in [its] manpower [and] capability to destroy U.S. manufacturing." Farr added that companies will continue adding jobs in China and India because they are "places where people want the products and where the governments welcome you to actually do something. I am not going to hire anybody in the United States. I’m moving. They are doing everything possible to destroy jobs." Last month's RF Cafe Book Drawing winner Brian A. selected the title Igor Grigorov's Urban Antennas because he was interested in concealing antennas in regions where outdoor antennas are prohibited by law or neighborhood covenants. I did a little research on what has been published on the topic. As you might expect, there is quite a lot of information available from the Amateur Radio crowd. In fact, the ARRL website has an extensive listing of resources based on articles in their QST magazine. 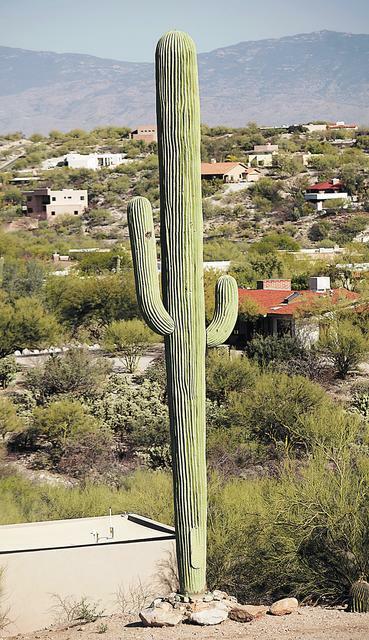 Disguising antennas as flag poles or stringing them in trees is common. A search did not turn up any recent vintage books on hidden antennas; maybe this is an opportunity for an author looking for a subject? EE Times has published the results of their 2009 Global Salary & Opinion Survey, based on 3112 responses. Many charts are available for viewing, but here is just the comparison of global salaries. Keep in mind the audience is electrical engineers & managers across all disciplines. How many times can you hear someone refer to something being "a teachable moment" before you go berserk and make it a teachable moment for him by throwing a book at his head? Here is a short list of similar annoyances that have been voted worst going into 2010. The calculator hackers are out there. Thing is, though, they are hacking themselves. Calculator hacking is serious entertainment for a small clique of ubernerdy guys. What might the motivation be other than self-satisfaction for being able to do it? Maybe to whack the egos of company developers? Seriously, what more do you need to add to a TI-83 Plus? Nothing, really. The goal is to be able to load a custom OS onto the machine, not enhance the existing software. Doing so could provide a cheap, powerful platform for portable process controllers, sensor interfacing, etc. TI is not impressed with the hackers and is suing them to cease and desist. Assuming the data used is accurate, this chart indicates that Moore's Law describing (not governing) IC evolution, when applied to computing efficiency, reaches back to the first digital computer - ENIAC. A study titled, "Assessing Trends in the Electrical Efficiency of Computation Over Time" found that when computing power as a function of electrical power usage is plotted, it doubles approximately every 18 months. Engineers expect the trend to continue. If the chart had resembled a hockey stick, I would have dismissed it as junk science. Thanks to the high number of visitors at RF Cafe, the website has outgrown its ability to exist on a standard server that is shared with 40-50 other domains. Over the last week, I have moved the website to a Virtual Private Server (VPS) that shares its Internet backbone connection with only 4-5 domains. You might have noticed a few hiccups as a result - like the Forums being inaccessible or pages not loading properly. Hopefully, everything is back to normal now. Thanks for your patience. If you are interested in a few more details, please click here. H-1B visas are issued to companies according to how successfully they can convince the government that acceptably qualified people are not available here in the U.S. This is a list of some of the top recipients H-1B visas. BTW, fashion models are also covered by H-1B visas. The guys at Popular Mechanics are famous for devising tests that pit consumer products against each other in face-offs that often become destructive. Usually the subjects are power tools, but this time they wanted to determine which cellphone would keep working at the lowest temperature (after all, winter cometh). One popular phone was so rugged that it no only kept working down to -55 °F, but partially survived a dunking in liquid nitrogen (-315 °F), where the display failed but the audio still worked. It took slamming it on the ground in its frozen state to finally render it completely nonfunctional.